Figure 6.1 (a) Aerosol SAD (¡Jirr cm ') at 19.5 km. 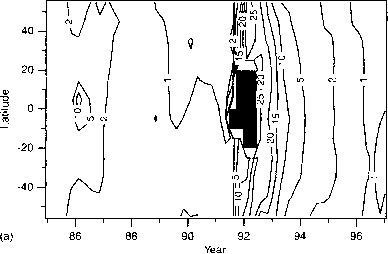 The black region in late 1991 and early 1992 indicates regions where aerosols were so thick that there were no measurements, (b) Time series of the aerosol SAD at 19.5 kni for three different latitude bands. The data in both top and bottom plots are zonally and seasonally averaged 1194 ]. The tick marks in the plots are January 1 of each year. increased within months to about 30 times its abundance prior to the eruption . 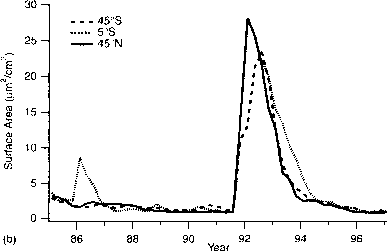 In the years since the eruption, the aerosol SAD has decreased, and, by 1999, the aerosol SAD was nearing the background. The maximum enhancement of the SAD from a volcanic eruption generally occurs in the lower stratosphere (e.g. 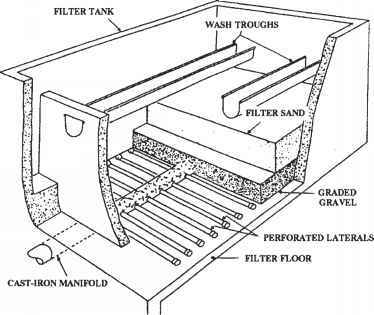 see Figure 2.3) because the vast majority of the volcanic effluent is only energetic enough to reach this level of the stratosphere.